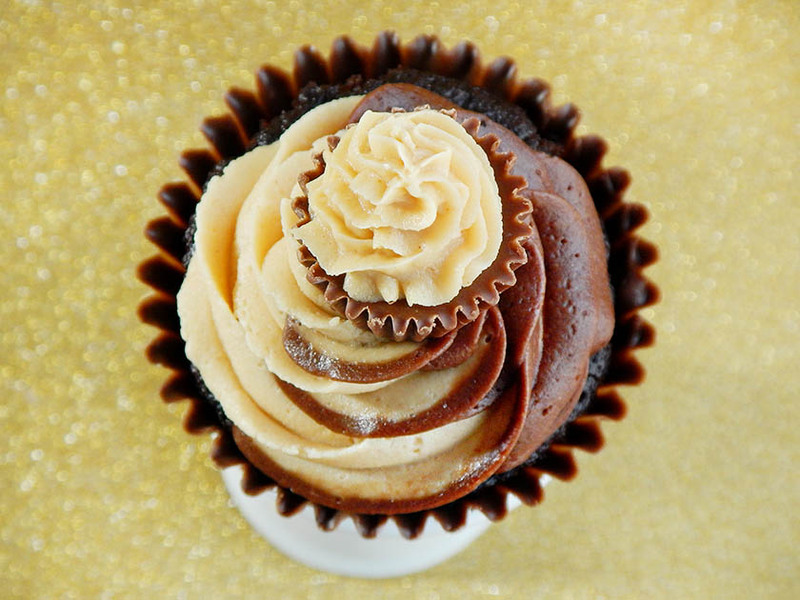 Rich chocolate cake topped with a two-toned swirl of chocolate and peanut butter frosting gets dressed up in an edible candy cupcake wrapper. 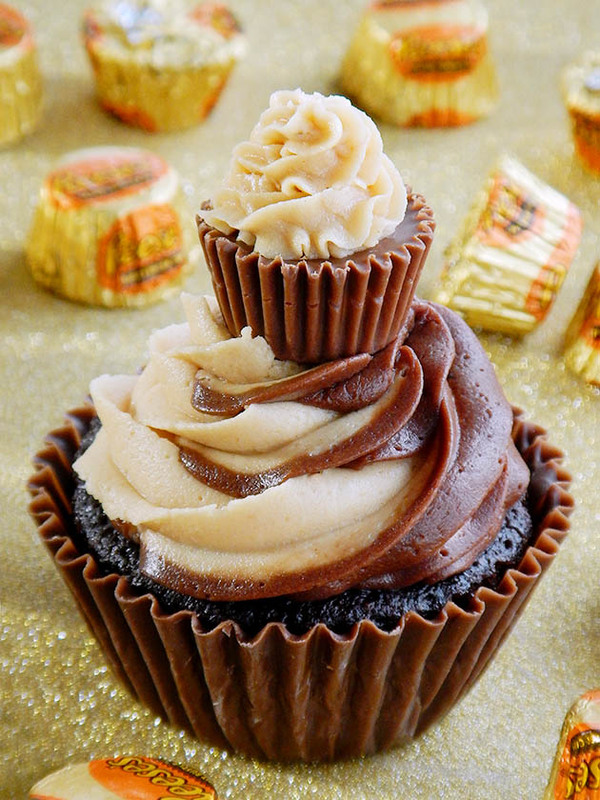 Top it all off with the cutest mini “cupcake” to create the ultimate chocolate peanut butter dessert. 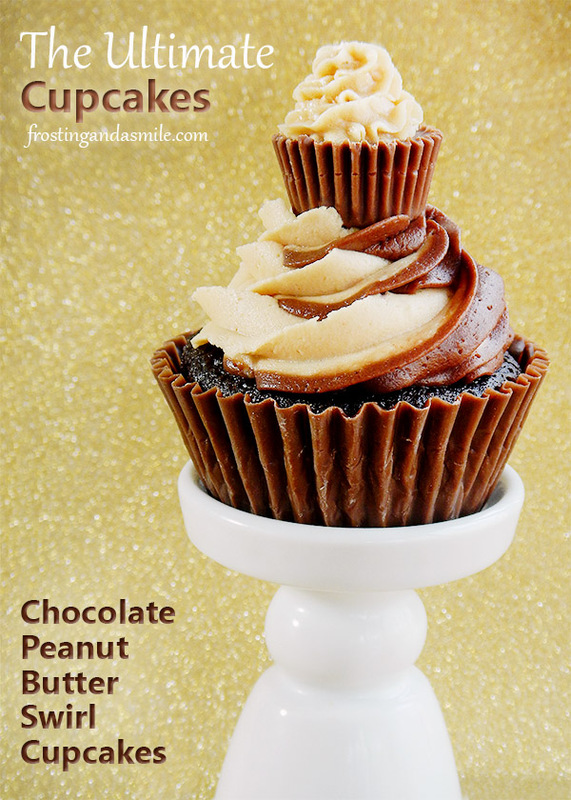 This is the perfect recipe for a peanut butter lover’s birthday bash or any occasion where you want to serve something seriously impressive. There are a lot of steps involved but none of them are difficult. We’ll walk through them together. 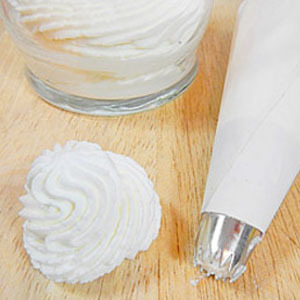 Use the back of a spoon to paint foil cupcake liners with melted chocolate or Wilton candy melts. Let them set until they’re hard. Then, gently peel away the foil. You can do this days (or even weeks) in advance (if you have the will power to avoid snacking on them). Just put them in an airtight container and store it in a cool dry place. If you need more details, check out my full photo tutorial on how to make edible cupcake wrappers. Let me preface this by confessing I gag on the “m” word. You know the one. It starts with “m” and rhymes with hoist? [Insert shudder.] Since I bake all the time, it’s as difficult to avoid as Pennsylvania pot hole in April. So let’s get it right out of the way. Sour cream and brown sugar make this melt-in-your-mouth m!@#$. It’s a half batch of Sandy’s Chocolate Cake, a super-popular recipe from Taste of Home. Preheat the oven to 350-degrees. 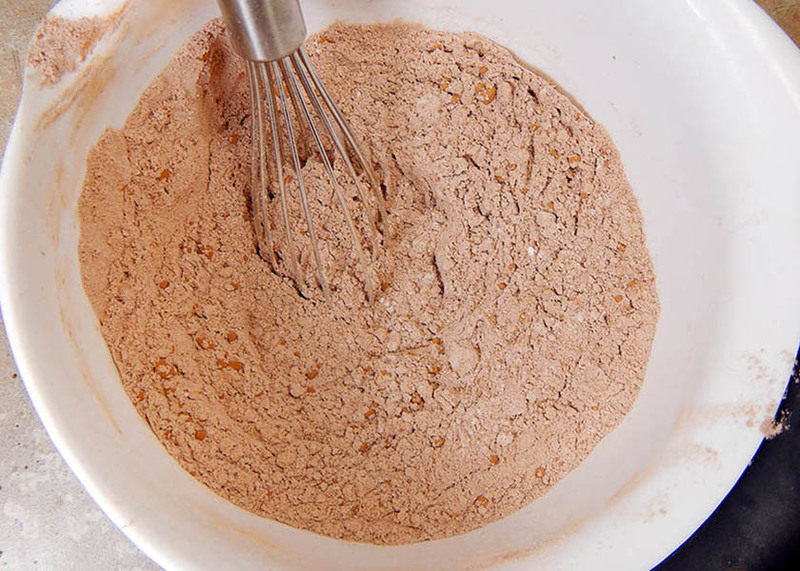 Whisk together 1 1/3 cups flour, 6 tablespoons unsweetened cocoa, 1 1/2 teaspoons baking soda, and 1/4 teaspoon of salt. Set aside. Beat 1/2 cup softened butter with 1 1/2 cups packed brown sugar. Beat in one egg, then another. Next, add the dry ingredients and 2/3 cup sour cream in three alternating batches. Stir in 2/3 cup boiling water. 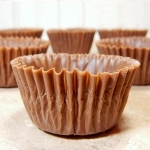 Scoop batter into (non edible) cupcake liners to bake for 18-20 minutes. They’re done when a toothpick inserted in the center comes out clean. An ice cream scoop is the perfect size and helps ensure all of your cupcakes are uniform. Cool your cakes in the pan for two minutes. Then put them on wire racks to cool completely. Once they’re cool, cut the centers out of them. 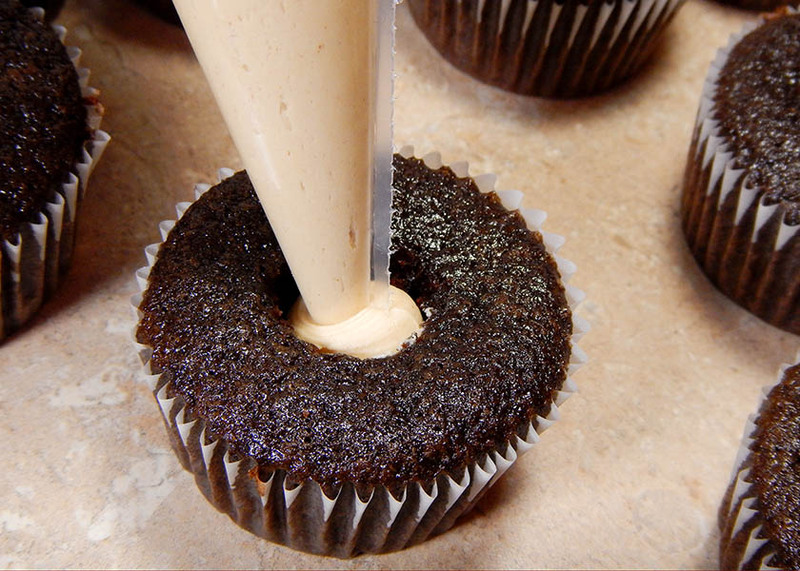 A cupcake corer is a great tool for this. 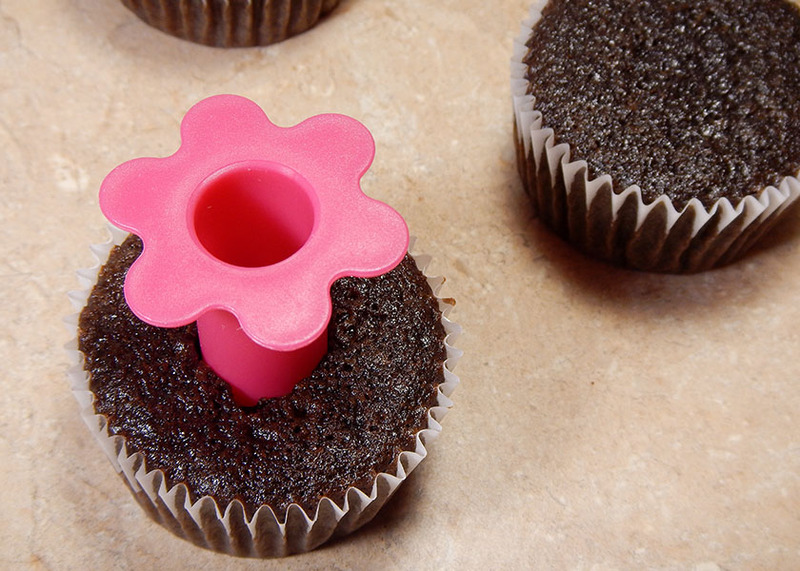 Here’s a link to my favorite cupcake corer . If you don’t have one, you can use a spoon or a knife. Just be careful! 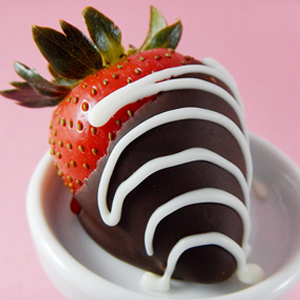 Use the leftover centers to make cake balls, or snack on while you work. You’ll fill those holes with peanut butter frosting, but first we have to make it! Each frosting flavor takes just a few minutes to whip together. Beat 2 sticks of soft unsalted butter with 6 tablespoons unsweetened cocoa powder, 1 teaspoon of vanilla, and a pinch of salt. Gradually add 4 cups of powdered sugar. Finish with 1/4 cup heavy whipping cream. 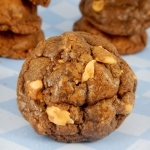 Beat 2 sticks of soft unsalted butter with 1 1/4 cups creamy peanut butter, and 2 teaspoons of vanilla. Gradually add 4 cups of powdered sugar. Finish with 6 tablespoons heavy whipping cream. Place frostings into small piping bags. Stack the bags then slide them into a larger piping bag fitted with a Wilton 1M tip. Twist the tops together and firmly squeeze onto cupcakes. 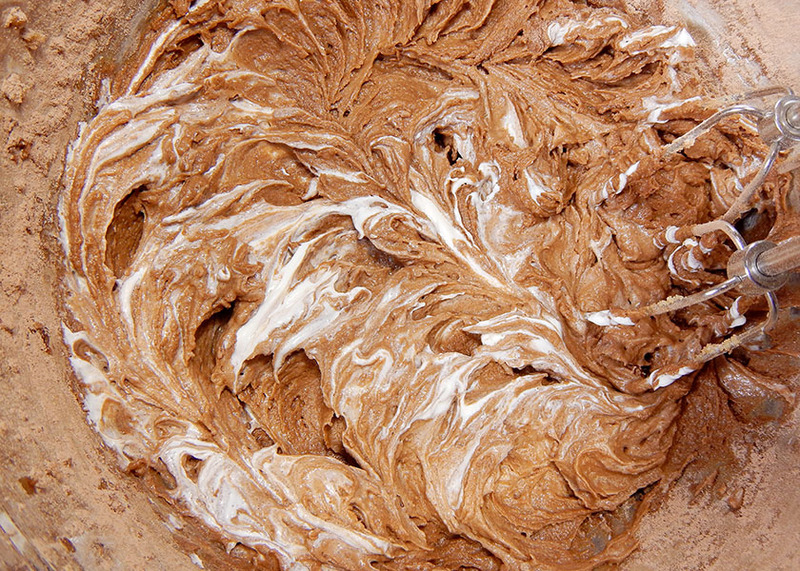 If you’re a visual learner (like me), you can see more precise details on how to swirl two frosting flavors or colors together in my chocolate peanut butter swirl frosting post. Since we’re going all out over-the-top here, let’s crown those chocolate peanut butter bad boys with more chocolate and more peanut butter! 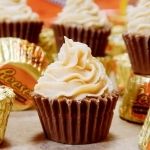 Use a small open star tip to pipe peanut butter frosting onto peanut butter cups. They’ll look like itty-bitty cupcakes. Need more details? 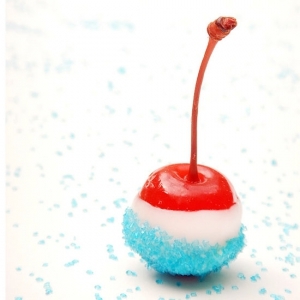 You can visit my full post on how to make candy cupcakes. 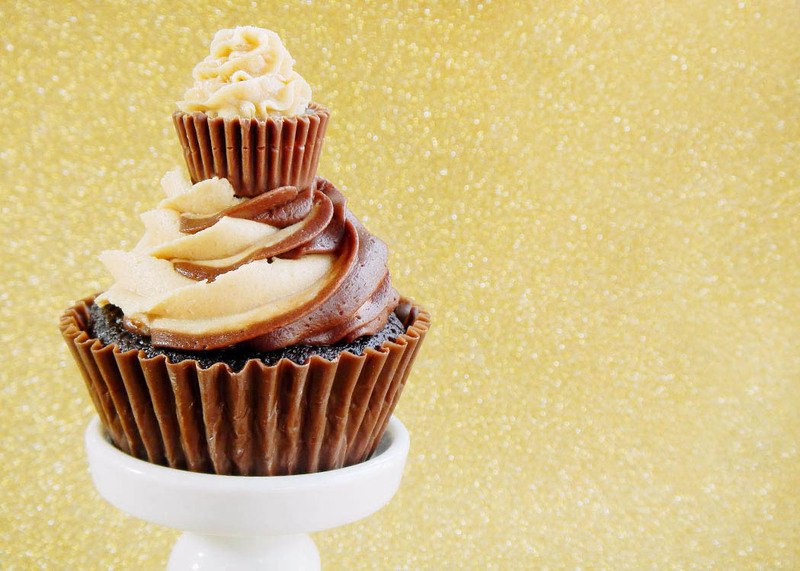 There you have it, an ultimate chocolate peanut butter cupcake in all its glory. When people see the stunning presentation, they can tell a lot of love went into these. I delivered a batch to the local 911 dispatch center staff to thank them for dealing with my constant questions. I work with the crew often during my day job in the news business. I’d love to hear who you are making these for and why are so special to you. You can let me know in the comment section at the bottom of the page. 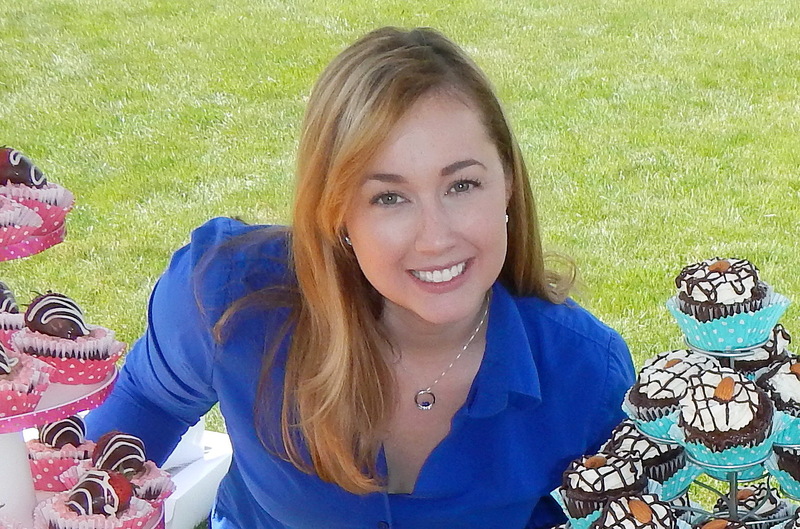 To make sure you don’t miss out on any of the fun, you can follow me on Facebook, Twitter, or Pinterest. You can also sign up for a free email recipe subscription. 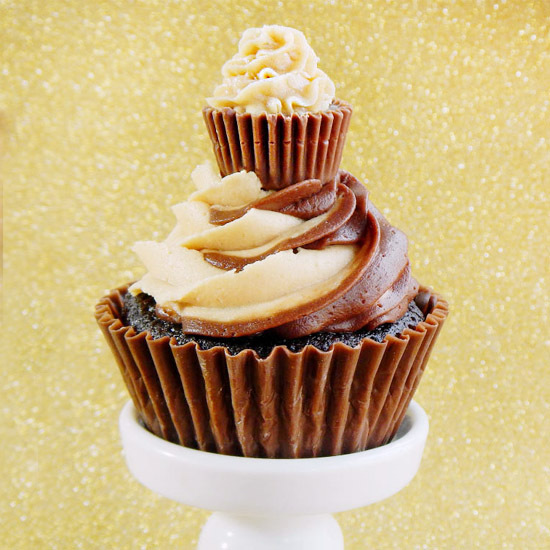 The best chocolate peanut butter cupcakes you will ever have. 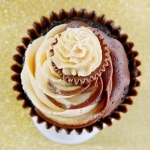 Rich chocolate cake in edible cupcake wrappers topped with a swirl of chocolate peanut butter frosting. Melt candy as instructed on package. 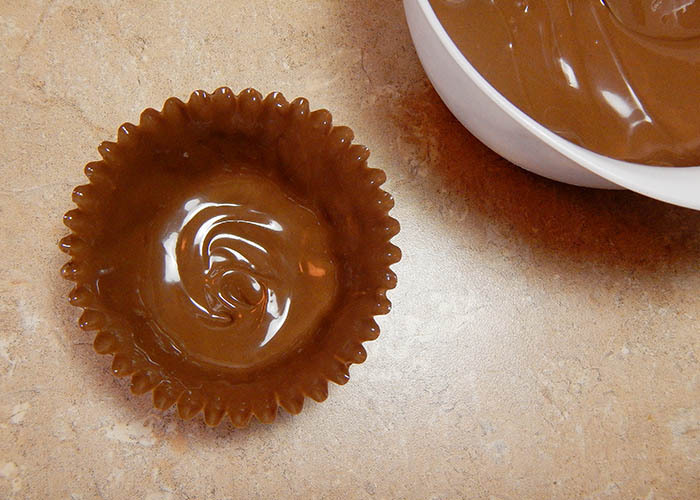 Use the back of a spoon to paint melted candy all over the inside of foil cupcake wrappers. Let set. Gently peel off foil. Preheat oven to 350-degrees. Place (disposable) liners in muffin tins. In medium bowl, whisk flour, cocoa, baking soda, and salt. 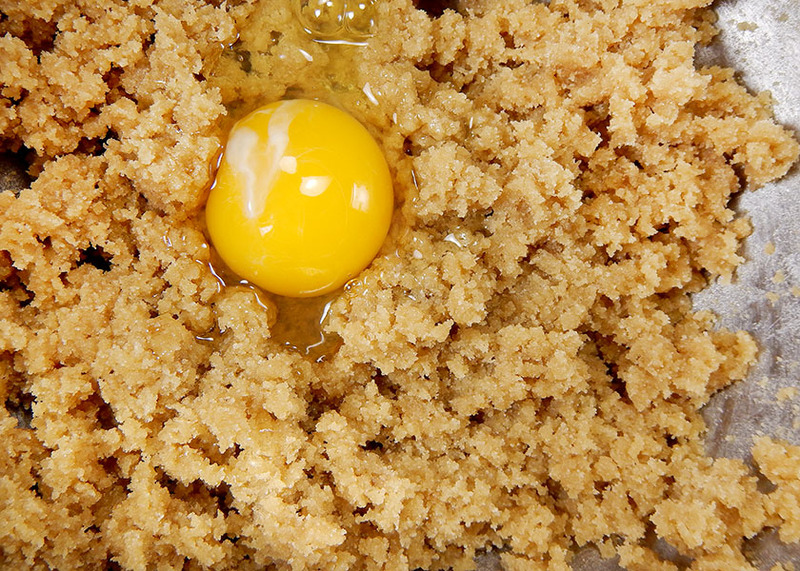 In large bowl, beat butter and brown sugar until light and fluffy. Beat in eggs one at a time. Mix in vanilla. Beat in 1/3 of the dry mixture. Beat in 1/3 of sour cream. Repeat two more times. Stir in water until just blended. Bake 15-18 minutes until a toothpick inserted in the center comes out clean. Cool in pans for two minutes. Remove to wire racks. Cool completely. 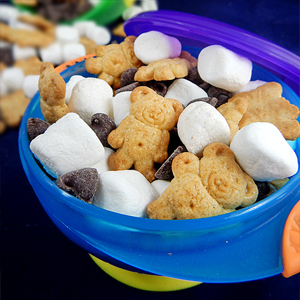 In large bowl, beat butter, cocoa powder, vanilla, and salt until light and fluffy. Gradually beat in powdered sugar. Add heavy cream. Beat until smooth and well combined. In large bowl, beat butter, peanut butter, and vanilla until light and fluffy. Gradually beat in powdered sugar. Add heavy cream. Beat until smooth and well combined. Cut a hole in the center of each cupcake. 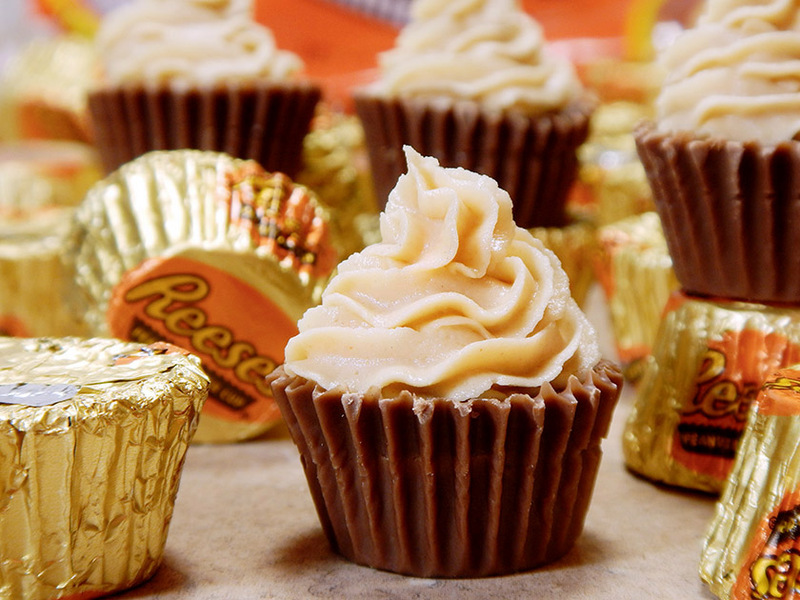 Fill with peanut butter frosting. Gently place each cupcake in an edible wrapper. 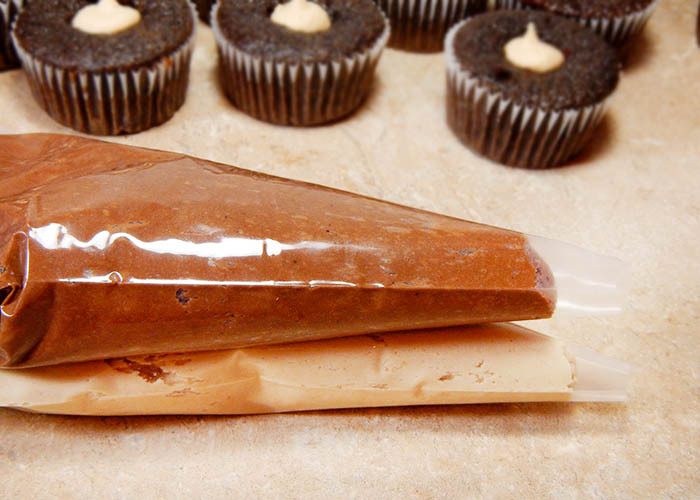 Spoon chocolate frosting into a small pastry bag, filling the bag about 2/3 of the way full. Spoon peanut butter frosting into a small pastry bag, filling the bag about 2/3 of the way full. Place both small bags into a large pastry bag fitted with the tip of your choice. I used Wilton 1 M. Twist the top of the bags together. Squeeze large bag with even pressure to release frosting. 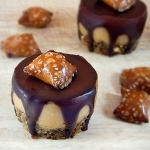 Using a small open star tip, pipe remaining peanut butter frosting onto mini peanut butter cups. Place one on each cupcake. Do you need to trim the sides of the cupcakes to fit them in the edible wrappers properly? You don’t have to trim at all. 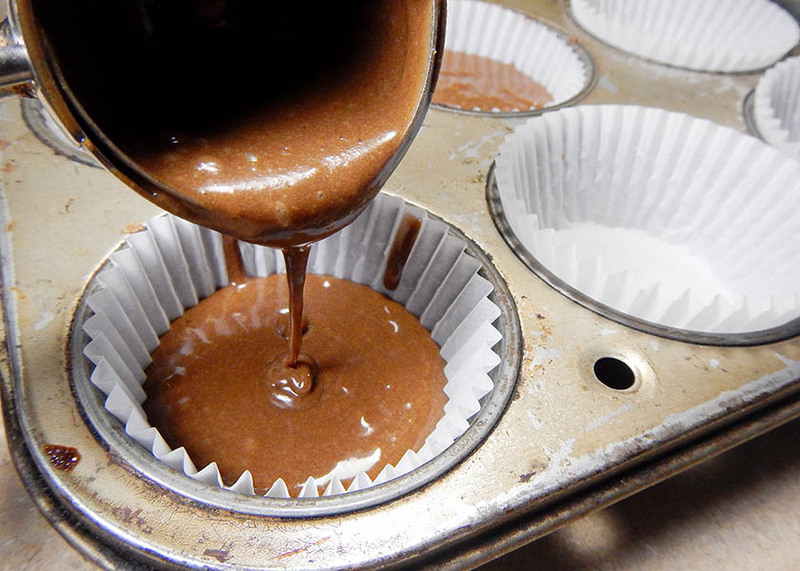 Standard-sized cupcakes will pop right into the chocolate wrappers.